I thought it was getting colder, but then it was a balmy 20C yesterday. Soup time? No, it is sandwich time! I don’t eat sandwiches very often. I still drool over delicious sandwiches, though. Including this one from Two Peas and their Pod. Like a souped up guacamole, this combined both of my versions. Chunky like my pineapple and cucumber guacamole but ramped up with chickpeas like my edamame guacamole. Filled with fresh cilantro, a zip from green onions and citrus tang from lime, this worked really well. You could use this as a dip with big crackers. Or slather it onto your next sandwich or wrap. Whatever you decide, you know it will be a tasty spread. And about that bread? It is an interesting sourdough rye bread. You can actually store it unopened at room temperature for 6 months. Something about it being double-baked or something. I first tried it in Calgary, but recently spotted a few versions at a nearby health food store, Foods for Life. And you know what? Their tempeh is just as cheap ($3.59) as Tutti Fruiti! There are a few reasons I don’t eat bread. One is because I don’t really like it. This bread was interesting, but not my favourite. It was merely a vector for the delicious filling. The best part was definitely in the middle!! This is my submission to Deb for this week’s Souper Sundays and No Croutons Required featuring sandwiches. 1. In a medium bowl, gently mash the chickpeas and avocado together. Stir in the cilantro, green onion, and lime juice. Season with salt and pepper, to taste. Spread makes 3-4 sandwiches, depending on additional ingredients. I feel the same way about sandwiches! If the bread is exceptional enough to be more than just a vehicle for the stuffings then I’d rather eat it on the side to fully appreciate the flavor. This reminds me a little of my cilantro lime chickpea salad. How did I not think to add avocado though?! Perfect pairing with the cilantro and chickpea flavors. I’ve eyed this recipe before – thanks for the reminder! 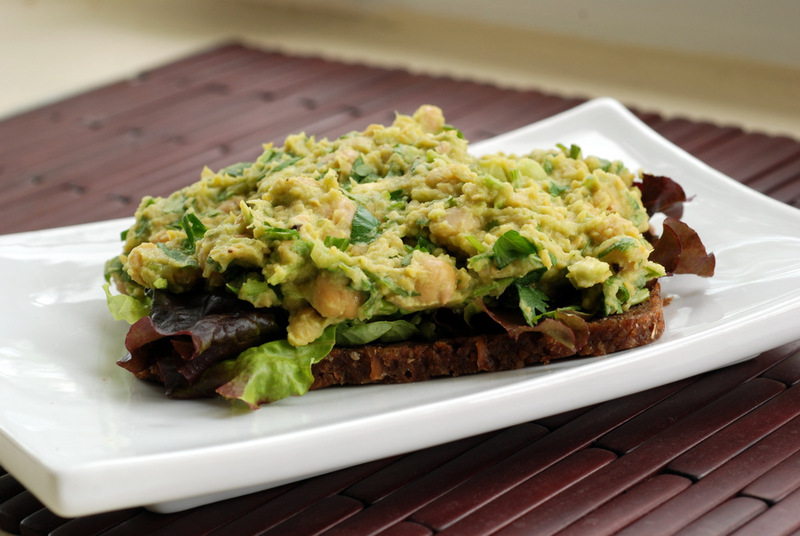 Chickpeas and avocados are some of our favorite foods so I can’t imagine not liking it!